We had a great fireside chat about Startups and innovative entrepreneurs, last night at the Dudley House at Harvard. 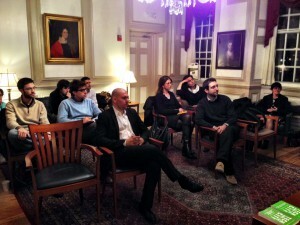 The Harvard Italian Society and MITaly organized a presentation of “Tech and the City” that kicked-off the “Italian startup week” in the two campuses. It was the occasion for a very interesting discussion about innovation moderated by Beth Altringer (center in the photo), director of the Behavior for Better Innovation Group at the Harvard School of Engineering and Applied Sciences and also co- leader of the I-Lab course in Cultural Entrepreneurship in New York City. 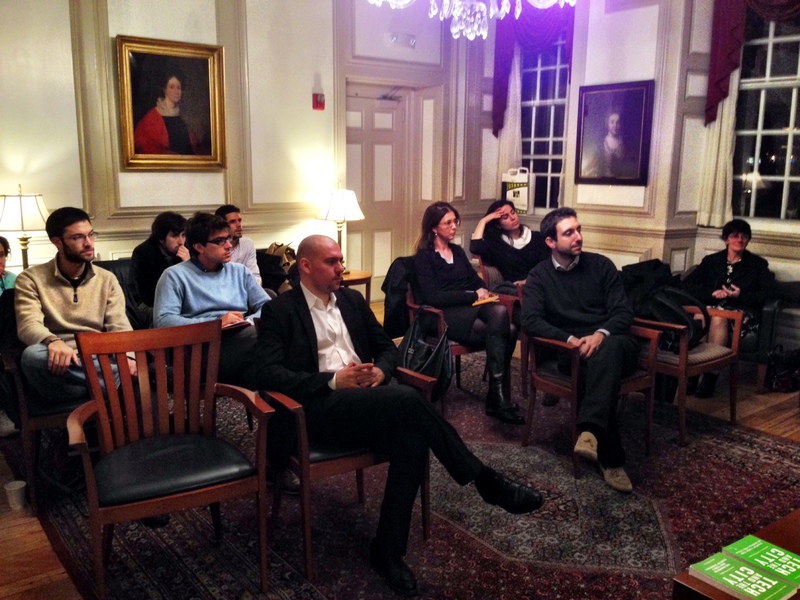 Raffaele Mauro (standing in the photo), researcher at the Harvard Kennedy School, introduced the event that was attended by the Scientific Attaché of the Italian Consulate in Boston, Cinzia Del Zoppo, and by a group of students-entrepreneurs. 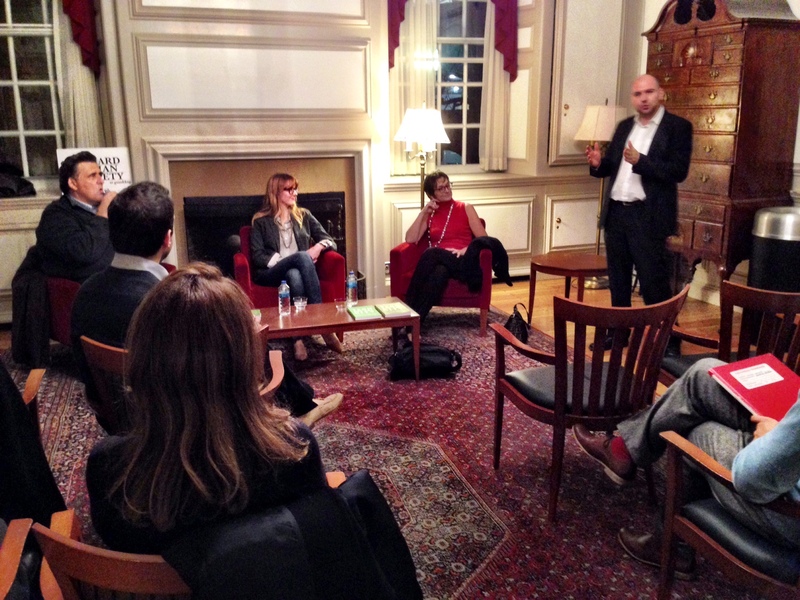 It’s worth to note that Harvard organizes a course devoted to explain to its students “the distinctive attributes of the booming NYC startup ecosystem”: they spend one week in NYC visiting startups and immersing in the community, and studying especially the cultural industries, which are one of the strength of the city. 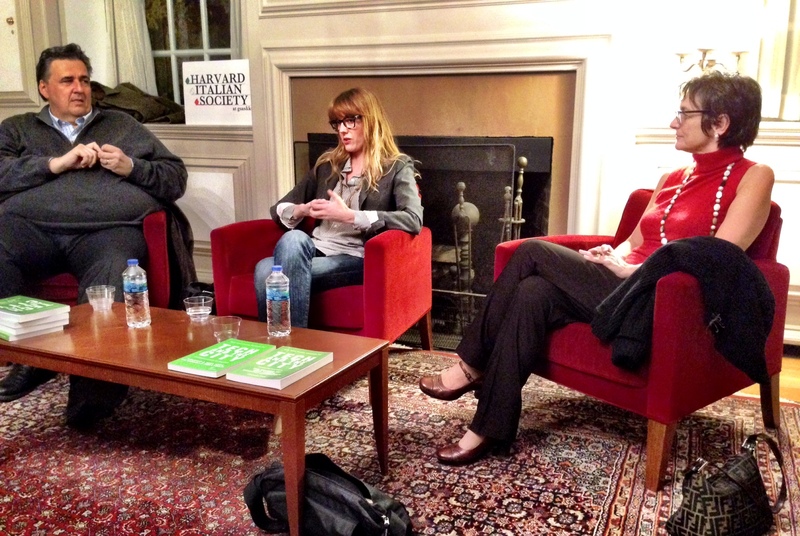 Talking about cultural startups, we learned about one with Harvard and Italian roots: Authorea. The Italian postdoctoral researcher at Harvard, Alberto Pepe, founded in Brooklyn, after moving to NYU as Visiting Researcher in Astrophysics and Cosmology. It’s an online tool for researchers and scientists to collaborate on scholarly articles; Harvard e Dartmouth have already signed to get the service. Collaboration among innovative entrepreneurs and old institutions such as universities and the media is indeed another special feature if the NYC ecosystem.